The voice selection greatly determines the processor power needed for the synth. Extra processor power is needed for every extra group of 4 voices. Selection between 1 (mono) and 16 voices is possible. The selection determines how many simultanious pressed keys on your key board wil sound togeteher. Mono is interesting for lead sounds or sounds where you want to use, the in the next section explained glisando effect. Poly4 and poly8 is suitable for most other sounds. For a selection higher then 8 you wil need a realy powerfull computer. The unison selection determines how many voices are played together with each key press. With the Unison knob you set the detuning amount between the Unison voices. Normally "Release" is selected at this function. It means that if a sound ended playing the voice(s) belonging to that sound are released and the processor power needed to calculate the sound is free for other use. The ending of the sound is determined by 0 output from the VCA module. If however you want to create special sounds like evolving soundscapes you don't want the voices released when crossing zero at the VCA. For this you can select "Hold". If "Hold" is selected the voices wil only be released if "Release" is selected or a next patch is selected. This hold function is essentialy different than the "Release/Hold" function at the voice section. When you turn this function on, the midi ON message comming from the keyboard or sequencer are latched into a midi buffer and wil continue to sound until you press a new key or combination of key's. 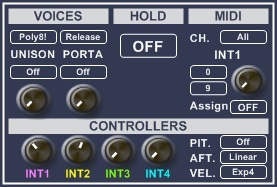 You can use this as a piano type sustain function or to keep (sequencer) sounds going.